The growing power of direct sales industry, including e-commerce, is increasingly looking for solutions to improve order picking process. 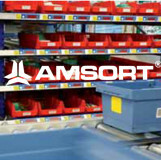 One of the solutions that works both in small, medium and in larger businesses Pick-by-Light / Put-to-Light picking system, offered by AMSORT. The system consists of racks with displays showing the number of items to be taken, lights, conveyors transporting the items from the warehousing area (optional) and original IT system driving the picking process (compatibile with the local WMS).